The future is now, my friends. Remember the days when you only wished you could have any and everything delivered right to your door? Thanks to 7-Eleven's "Date Night" and "Hangover" Convenience Packs, now you can. And packaged according to relevant life themes, no less! Just imagine this scenario. You're hanging at home bingewatching Breaking Bad (finally) with your guy when things start to get Walter-White-hot... only your breath is still kickin' from the garlic bread you had with dinner, plus you can only find one questionably dated prophylactic in your nightstand. Womp, womp. Nothing can ruin a romantic evening faster than lack of preparedness. Enter 7-Eleven, with themed deliveries which — score — include a thoughtfully curated "Date Night" kit. So, if you're looking to get lucky in the near future, know that 7-Eleven has your back. For the bargain price of $20, they'll rush a package to your door filled with the following date night essentials: Ben & Jerry's Chocolate Chip Cookie Dough ice cream, a Hershey's chocolate bar, an 8.4-ounce Red Bull energy drink, an 18-piece pack of Trident gum, and a three-pack of Trojan Ultra Thin condoms. Ingenious, cost-effective, and presumably compelling... what's not to love? Aside from the fact you didn't think of it first. But if the only thing you plan to binge-snuggle on Saturday night is a bottle of wine or a 12-pack of craft beer, 7-Eleven has a treat in store for you, too — the "Hangover" kit. This gem will only set you back $15 and, if you plan accordingly, will prevent your head from exploding on Sunday morning. It consists of extra-strength acetaminophen, a 25-ounce fruit punch Gatorade, a large pepperoni pizza, and a smoked turkey and pepper jack sandwich. Henceforth, you can channel the spiritual energy traditionally spent praying to the porcelain god toward revering 7-Eleven instead. 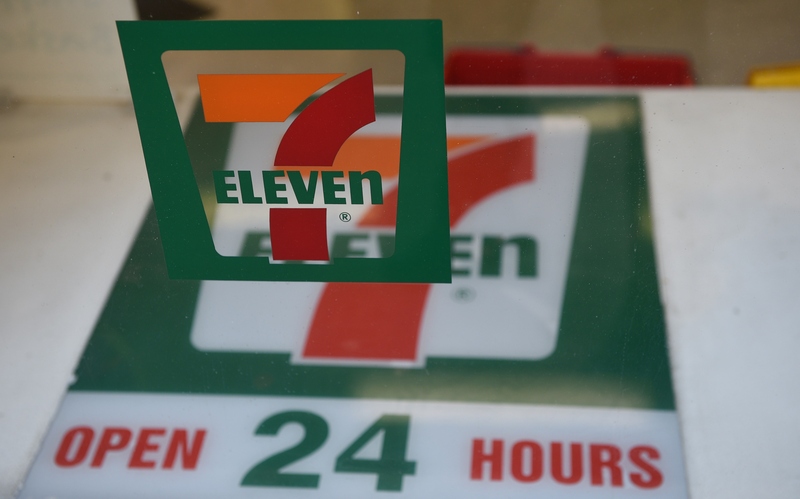 These Convenience Packs come on the heels of the news earlier this month that 7-Eleven would be teaming up with DoorDash, a startup that delivers food from restaurants across the country to the front doors of we hungry, albeit slightly lazy consumers who can't be bothered to leave the house. Unfortunately for many of us, though, Orange Is the New Black may drop a new season on Netflix before we ever get to benefit from 7-Eleven deliveries, as the service is currently only available in New York, L.A., and Chicago. But good news for those guys — they're guaranteed delivery in 45 minutes or less. And since I fall in a current no-fly zone, so to speak, well, I've got some time to kill. As such, I've thought up a few other Convenience Packs 7-Eleven should consider adding to their roster of deliveries. I mean, right? For every couple spooning somewhere this weekend, some poor soul somewhere else is nursing a broken heart. This kit would include a carton of chocolate ice cream, a tin of Fresh-to-go brownies, a DVD copy of 500 Days of Summer, and a box of Kleenex to cry into. 7-Eleven and football season go together like peanut butter and jelly. Salt and pepper. Grace and Frankie! OK, so perhaps that isn't the most apropos analogy, but you get my gist. Hosting game day at your house would be so much easier with a Big Game kit of buffalo chicken wings, mozzarella sticks, a 6-pack of Coors Light, sour cream & onion potato chips, and Pepto Bismol for the scorching heartburn this kit will surely score you. Sometimes, it's nice to just sit on the floor, sifting through old pictures and reminiscing over days gone by. Like, you know, when you could rock bejeweled jellies without so much a sideways glance and when slap bracelets were still a thing. The Nostalgia kit will take you there, guys. Make your visit to memory lane, well, a memorable one with a box of old school ice cream sandwiches, a bag of Gummi Worms, an EasyMac Cup (hello, middle school! ), and a handful of SlimJim-style "snack sticks." Best served with marathon sessions of '90s TV shows. Camping is right up there alongside football as one of fall's most highly anticipated activities. Only, not everyone is built for life in the great outdoors. Some of us get, like, really cold. And there are bugs. Big ones. But I digress. Embrace this cooler weather pastime by ordering a 7-Eleven "It's Too Cold for Actual Camping" Camping Trip kit. It's got everything for the glampers at heart, including s'mores ice cream, instant coffee, and a bag of beef jerky. Bonus points if you drink your coffee out of an enamel mug and snooze in a sleeping bag.